This blend addresses discomfort in the joints and limbs that results from normal training and everyday activities. The horse that would benefit most from this blend is generally weak, has a poor hair coat, and lacks luster to the eyes. The horse has achy joints and limbs resulting from prolonged wear and tear. Lower back discomfort may also accompany these issues. This will often get worse with cold and damp weather. Not for use in pregnant animals. If animal’s condition worsens or does not improve, stop product administration and consult your veterinarian. An examination from a veterinarian is recommended prior to using this product. Not for use within 48 hours of surgery/anesthesia. 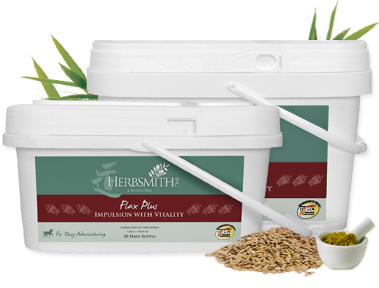 Still Have Questions About Flax Plus Impulsion with Vitality?